"OUTSTANDING!!! I love these guys. Have been going since around 2002. Have always treated me fair. And, now the other people I've sent say the same things. Definitely give them a try!!!" "I have been taking my cars here for 8 years. Even when I lived out in Riverside for 1.5 years, I still brought it to Halsey's to get serviced. My friend of 20 years and his parents have been loyal customers for at least 20 years, and I am very thankful for their recommendation!" "Word of mouth brought me to Halsey's 10 years ago! They have great mechanics! They are ethical, fair, and honest which is hard to come by when you are a single woman. They don't come any better than Beto! I live in Burbank but I don't let anyone else touch my car! Bring your car to Halsey's! You will be sooooo glad you did! Mary Agn Camp"
"Great service, great customers skills , great prices ! You need your car taken care of ?! Make sure you stop by this amazing shop were Halsey the owner or Beto the manager will make sure that you get the best service for your car. Quick, fast, easy and great!" Welcome to Halsey's Auto Center in Canyon Country, CA. 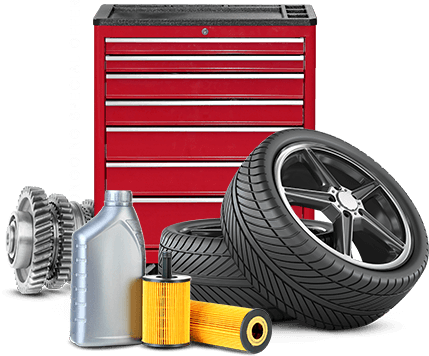 Your Complete Auto Repair and Service Shop. Come to Halsey’s Auto Service and enjoy the benefits of an established company that’s been serving Santa Clarita since 1983. Are you looking to upgrade the quality of your auto repair and service facility? Come to Halsey's Auto Service and enjoy the benefits of an established company that's been serving Santa Clarita since 1983. We're firmly committed to our customer's needs: great auto repairs and timely service. When you come to us, you'll notice right away that we have a talented team of technicians capable of taking proper care of your car, truck or RV. In fact, we excel at complete auto repairs and specialize in brakes, tune-ups, air-conditioning and computer analysis. When your engine's running a little rough or your air-conditioning isn't blowing cool, refreshing air, give us a call and we'll take care of it. At Halsey's Auto Center, our goal is to provide our customers with a warm, friendly and professional environment and to ensure that the total experience meets or exceeds everyone’s expectations. We specialize in domestic and foreign cars and trucks. Halsey's Auto Center uses high-tech diagnostic equipment to guarantee your vehicle is repaired and/or serviced correctly the first time around. We only use the highest quality replacement parts, filters, oils, and components when it comes to your car. It is our ultimate goal to help you avoid expensive repairs by helping you maintain your car so it can go the distance. Our services include: complete engine repair, full brake service, computer diagnostics, engine diagnostics, heating and cooling services, electrical diagnosis/services, front and rear suspension, tune ups, preventative maintenance, shocks/struts, timing belt replacement, free estimates wheels and tire replacement. Our experts have the knowledge to service and repair even the most challenging repair problems. Whether your vehicle needs a minor tune-up or a major overhaul, our trained service technicians are highly skilled and qualified to get the job done right. The entire brake system is inspected for leaks, master cylinder corrosion, worn pneumatic parts, harmful varnish build-up, broken or rusted bleeder valves, worn rotors and drums and air in the brake lines. The fluid that lubricates all of the transmission’s moving parts works just as hard as the transmission and should be changed as recommended. Every automotive service that Halsey's Auto Center performs is backed by a Limited warranty. For all services not covered by specific warranties outlined here or printed on the customer invoice, the standard warranty is 36 months or 36,000 miles – whichever comes first.